Experience thermal comfort on demand. Embr Wave lets you cool down when you’re too hot or warm up when you’re too cold. 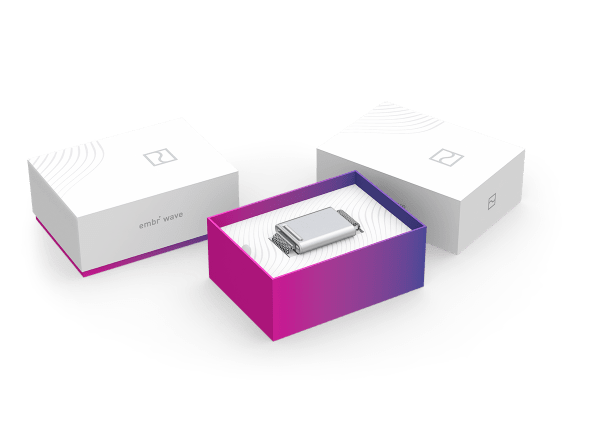 Embr Wave is powered by patented technology that uses cutting-edge thermoelectrics and precisely engineered algorithms to produce maximally effective temperature waves. 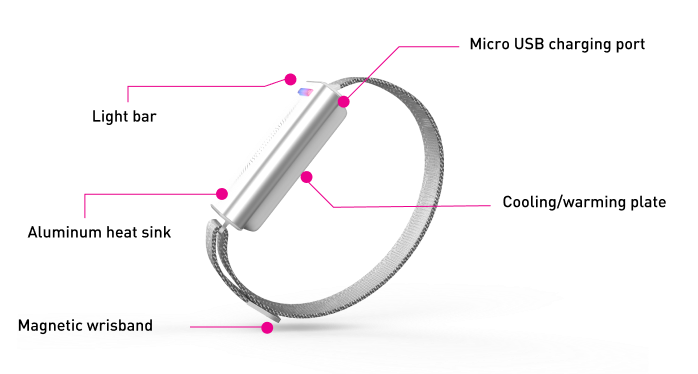 It fits comfortably around any wrist size, lasts 2-3 days per charge, and pairs with the Embr Wave mobile app for enhanced thermal visualization and control. Powered by patented technology that uses cutting-edge thermoelectrics and precisely engineered algorithms to produce maximally effective temperature waves. Fits comfortably around any wrist size, lasts 2-3 days per charge, and pairs with the Embr Wave mobile app for enhanced thermal visualization and control. Whenever you start feeling too hot or too cold, just press and hold the Wave’s Light Bar to activate a comforting wave of cooling or heating on your wrist. Cooling feels like an ice cube, and warming feels like cupping your hands around a hot drink. How can it make you more comfortable? Fact: how hot or cold you feel has far more to do with local temperature sensations than your core body temperature. By cooling or warming your wrist, Embr Wave triggers your body’s natural response to temperature change, making you feel colder or warmer in minutes. When and where does it ship? If you order now, your Embr Wave will ship in 2-3 days. Due to product certifications and privacy laws, Embr Wave is currently only available in the United States and Canada. or ice pack could offer.